For an MS Paint style job, there were things here I liked conceptually. Atheist atom logos should be banned and using both red and black on white can diminish each’s impact, but the heart (symbolising relationship anarchy) was a strong element and pairing it with something scientific spoke to the subject matter of the blog. Knowing the author of the blog, it also struck me as representing his personality – writing on relationships and emotional issues from the viewpoint of a skeptic and a lawyer. Relationship anarchy, and I identify with it just as he does, argues it’s pointless sorting relationships into fixed categories because each is unique: that we needn’t treat friendship, attraction, affection or romance as non-overlapping magisteria. If no rules beyond consent govern what a relationship can be, there’s no reason just to have one, and if partnerships are like friendships, having many at once to satisfy different needs is obvious. As a skeptic, how do you represent that visually? From the start I wanted to keep the heart motif. Initially I thought of drawing on the atom idea, perhaps with an electron orbiting it, but the moment I tried to draw that it looked tacky, derivative and incomplete. It wasn’t enough just adding symbols of reason to symbols of love. The two had to merge conceptually: in philosophical terms, had to be synthesised; in chemical terms, had to be a compound instead of a mixture. There should, I originally thought, be one large heart made up of smaller ones in a field of mathematical symbols – in particular, ones significant to poly partnerships. (An equality sign, infinity, sigma and so on – here’s a rough version.) But the more defined the tessellated hearts became, the clearer it was nothing should compete with them – particularly when I saw how they looked as a background. It’s a very seventies patchwork when the colour combinations are considered, which actually I don’t mind. I’ve a lot of time for that stylistic period, and for a poly site, why not channel the decade of free love? (That is, of course, a wishful-thinking description.) But a banner designed now should fashion rather than costume: the blog name needed a typeface that would keep the image modern but evoke the same era. Octopus, Hawthorn, Cooper Black and Davida were all out, too seventies to look like anything except pastiche. Bodoni, Futura, Eurostile and Helvetica, I considered and discarded – not stylised enough to clarify the brand. ChunkFive tempted me strongly – here’s how it looks in context – but like the first few typefaces it felt too literal, as well as too ubiquitous. Then I found Albert Estruch’s font Blanch in my collection. Instantly I fell for it – in particular the variation in the final banner. Inline fonts got popular in the late seventies and early eighties when the age of computers began, which makes Blanch perfect atop a blog, and negative space means it doesn’t overpower the background. 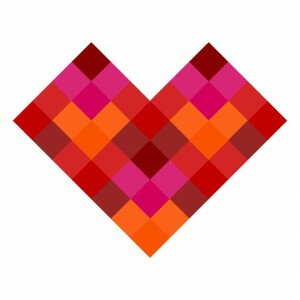 Both Wes and I want the tessellation heart to be a polyskeptic symbol – so many friends in the secular scene are poly, we had to have an icon sooner or later – so the version above is open to communal, but I added the blog’s name to it just for him. I’m pleased with it. So, I think, is he. Is this true, I’ve never heard it before. Though being a polyskeptic myself lends a bit credit to it.